Every so often, a woman's just got to get away from her family and have a girls' knight. Remember in Mythic Legions Series 1, how the Four Horsemen did a deluxe Barbarian Builder Set that threw a bunch of the modular pieces together to allow you to design your own warrior? Well, they've done the same thing for Series 2, featuring their new armored female body. 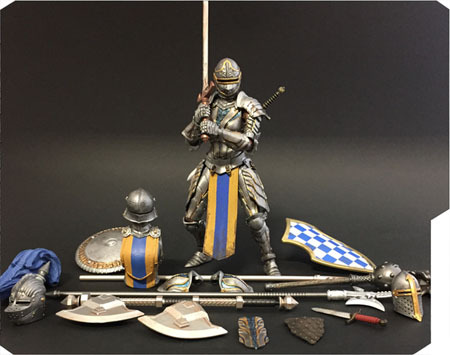 Behold, the Deluxe Knight Builder Set 2! There's no biographical information on the packaging (other than the mark identifying her as part of the Army of Leodysseus), because this isn't just one character - this is the armybuilder you buy dozens of and have them flank the real heroes. But that means you get to decide who she is. Is she Jacoba the Clumsy, a knight who dropped one dish - one! - when she was a squire and has never been able to live it down? Hawys the Adamant, whose loyalty to the crown is unyielding? Aaliz the Hungry, who is constantly stealing food from the barracks pantry because eating takes her mind off her constant battles? Tephna? Jimme? Ebbot? Marekyn? Amelinne? It's entirely your call. So meet Auisia the Enigma, the dramatic paladin from the endless wastes who drunkenly swore a blood oath and forgot what for! 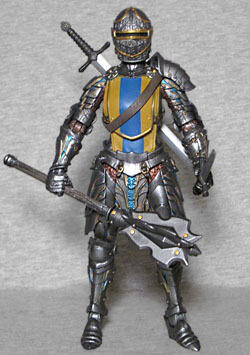 The knight is of course covered entirely in armor from head to toe, with no exposed skin. Already putting her one ahead of the Barbarian when it comes to customizability, we get our choice of two torsos: the first is the same mold the Skeleton Soldier Builder came with, though the fact that it's painted in much brighter colors here makes the detail easier to appreciate; the second chest, meanwhile, appears to be the same thing, just with a separate (sculpted) cloth layer worn over it like a tabard. 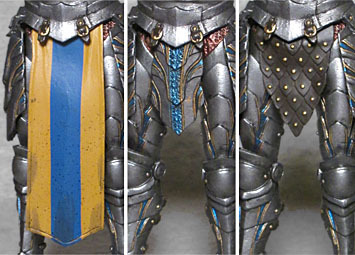 The loincloth the figure is wearing in the packaging matches that second upper body, being a shin-length drape of mustard-colored cloth with a deep blue stripe down the center. That's the same way the tabard was colored, so together they look like one unbroken piece. 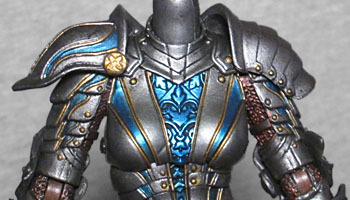 If you prefer a different look for her, well, Mythic Legions groin-guards are removable, so you could instead give her two other metal merkins - a small one, designed to better match the uncovered chest armor, and a wider, leathery, scale-mail triangle. 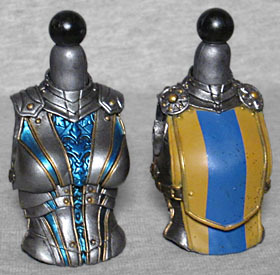 So with two different chests and three different modesty flaps, we already have six different ways to build this knight. Do you feel like Emelisse the Fair (the cool-headed fighter from a small town on the border who carries a cryptic treasure map she won in a tavern bet) needs more protection in the shoulder area? Well good news, the set includes two styles of pauldrons you can plug into her back: one pair ornate, the other simple but layered. Both of them look great with either set of armor, so we're now up to 18 possible armor combos. Unless you're okay with asymmetrical armor - in that case, there are nine ways to display these pieces, meaning 54 combos. You know what we haven't discussed yet? The head. Since Madlyn la Courtoise (who rejected a foreign prince's marriage proposal) is supposed to be a generic soldier, she doesn't have an exposed face - and that means full-head helmets. Four of them, in fact! In the tray, she's wearing a pointy heaume with a golden cross over the eyes. There's a highly ornate armet à rondelle, complete with the large disc on the base of the skull. You could give her the close helmet, with its options of a spike or a large feathery plume. Or how about the long-tailed sallet, which sounds like a species of bird but is not? That's five more options, for 270 combinations. Mahald the Agile (the gruff cleric from an aristocratic family who distrusts all authority) needs weapons, and she's got weapons! The barbarian only had the same weapons every single figure came with, but the knight does better. Yes, there are the swords, and the dagger, and the modular axe. The spear and the shield and the chest strap. But we also get some of the fancier weapons only available in the first series' weapons packs: a circular shield, a halberd, and a mace with your choice of round or flared heads. Given all those pieces, and the option to carry weapons in one or two hands, or to have the large shield clipped to the arm at the same time, or to put one of the weapons in the strap, that means... I'm not even going to try to do the math any more. We're already into the "tens of thousands" territory, which is more than anyone is ever likely to assemble. And we haven't even discussed the wing-adapter backpacks yet! 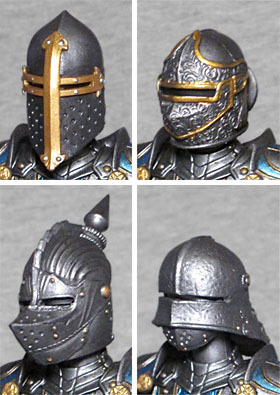 The Deluxe Knight Builder Set costs more than the other Mythic Legions figures, but then, it's a deluxe set. It comes with more pieces. A lot more! And whether you want this to be Minnie the Dragonheart, the loud Human Fighter from the strongest family heritage line in the land who always alliterates her anecdotes, or you just want it to be some unnamed knight who's going to provide support for your other characters, it's going to be a terrific toy with a lot of play options. And how ever you decide to outfit her, she'll look awesome.